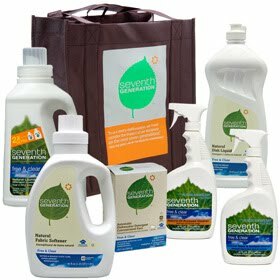 The Free & Clear line from Seventh Generation are biodegradable, non toxic cleaning products that are free from fragrences, dyes, and masking agents. I had the pleasure of testing many of their products from this line and can highly recommend them to you. 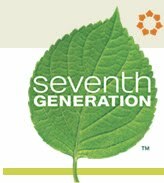 The first thing that I like about Seventh Generation is that they’re proactive in trying to reform how the US in particular looks at the safety and environmental impact of cleaning and personal products. The second thing I appreciate is that they genuinely want to help people out. They continually offer contests and send out free samples of their products to people, as well as offer ongoing education through their website in the form of Q&A and pages dealing with ingredients and topics specific to the products. It’s often difficult to get a straight answer from companies when you ask them tough questions, but Seventh Generation has been quick and thorough in answering any questions I have had for them! I found the Free & Clear line to honestly not have a fragrance. The liquid laundry soap has a slight odor to it, but you can tell it’s just naturally from the ingredients used to make it. Everything worked just as well as a commercial chemical cleaner, but it was much more pleasant to use because it isn’t harsh on your skin and you don’t have to worry about breathing it in or pouring it down the drain! 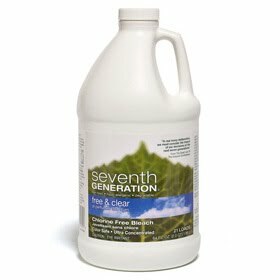 You can view all of the ingredients for any of these products on the Seventh Generation website. 2x Liquid Laundry (32 oz.) – This unique, non-irritating blend of plant-based surfactants and enzymes powers out the toughest stains. This works quite well. I don’t have to use very much, the container is small, and it doesn’t seem to create any build up, though I would still not use it for cloth diapers. Hand Dish Soap – Tough on grease, gentle on your hands and the earth. No phosphates, safe for even the youngest dish-washing family members. This is definitely gentle and still creates decent suds (though that is NOT necessary to clean). I do kind of miss having a good scent while I’m washing dishes though. 🙂 The non-irritating qualities would make this excellent for anyone sensitive to traditional dish soap! All-Purpose Cleaner – Cleans and degreases hard surfaces, indoors and out. Non toxic, it creates no harsh fumes. Safe for your family and the planet, great for wet mopping; not recommended on wood floors. I use this for everything from counters to floors. It doesn’t particularly get hard scummy areas (like a bathtub) to clean up easier, so I’d recommend another product for that. This is an excellent product to just have around for quick cleaning. Auto Dish Tabs (15-count tabs) – Concentrated automatic-dishwasher packs deliver phosphate- and chlorine-free detergent in convenient packets. Environmentally friendly, safe for your family. These did get our dishes clean, but when combined with our soft water, we found that some of our aluminum/stainless steel dishes didn’t fair so well. 😦 Be sure to not use on metal dishes and silverware like this! Otherwise, it was a great product and dissolved quickly in the water. It also seemed to rinse off well and not leave any residue. Glass & Surface Cleaner – Effectively cleans glass, mirrors, chrome and other hard surfaces – without streaks, toxins, fumes or harsh chemicals. Works as well as other commercial cleaners but without the scary chemicals and smells. However, the old vinegar/water solution still cleans windows best. I particularly like to use the Glass & Surface Cleaner for wood/glass or plastic/glass areas. Liquid Fabric Softener – Free & Clear 40oz.Canola-derived fabric softener makes your laundry naturally fluffy and static-free. Add to your final rinse cycle or use for hand-washing delicates. Truly free and clear of fragrances, dyes, and masking agents. I have never had such soft clothes until using this! I don’t know if I’m using too much or if it just REALLY works, but it works! No static, and very soft clothing. Be careful to not let it build up on your washer if you have cloth diapers. Natural Fabric Softener Sheets – I didn’t find these to work as great as the liquid fabric softener, but they certainly do lead to static-free clothing and aren’t nearly as greasy as regular softener sheets. If I was in the habit of buying softener sheets, I would definitely purchase these. Rinse Aid – Never having used a rinse aid for my dishwasher before, I wasn’t sure what to expect from this product. However, I found it to last a long time and it did help to minimize water spots on my dishes! Buy It! Through the Seventh Generation website or at many local retailers. Win It! One winner will receive the Free & Clear Starter Kit with the six items listed above as well as a handy dandy tote bag to keep everything in. A value of $30.00. To enter, visit Seventh Generation’s website and tell me one product you’d like to try (not listed here) or something you learned on their website. Be sure to leave a separate comment for each entry and include an email address each time! Contest ends December 23, 2009 at 12:00PM EST. Rachel’s Guide To a Low-Stress and Cheap (or FREE) Christmas! id like to try thier baby wipes! I want to try their diapers on my kiddo! I'd like to try their diapers. Would like to try their paper towels..curious on how well they work. would like to try their baby soap or laundry liquid! thanks for the chance! i use quickleen-s for cleaning a lot of things. its eco friendly to. We use a lot of garbage bags-the recycled trash bags for me. Great Giveaway! A product that I would also love to try are the Chlorine free diapers. We mostly use cloth, but these would be wonderful to use when traveling. I'd like to try their diapers. Thanks!